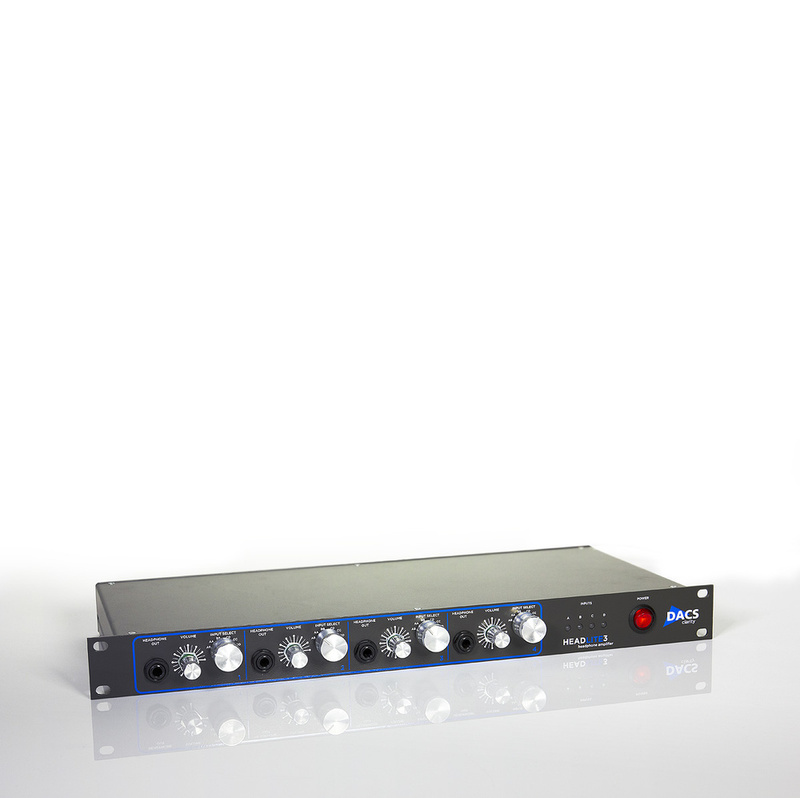 British company DACS manufacture a high-quality range of preamps and studio problem solvers, and one of their most popular items is the HeadLite, a versatile four‑input, four‑channel stereo headphone amplifier. It’s a unit I’ve seen in project studios across the land for many years, so I was astonished to discover that, hitherto, it had never been reviewed in SOS! This latest, third-generation incarnation is called the HeadLite 3 and forms part of the company’s Clarity range of products. While it looks almost identical to its two forebears, there are actually a few updates to its appearance, including the addition of four multi-colour metering LEDs on the front panel, and shiny aluminium control knobs instead of coloured plastic ones. As I’ve said, the HeadLite 3 provides four independent stereo headphone amps, each with a standard quarter-inch output socket on the front panel. Each socket is duplicated (wired directly in parallel) on the back panel — a thoughtful feature which makes for neater wiring both when the HeadLite is rackmounted in the control room and when feeding headphones in the studio. It also allows the engineer to quickly plug in at the front to confirm what’s being sent to the artists, or for an artist to plug in and hear the same cue feed whether performing in the control room or the live room. Each of the four stereo headphone channels has its own independent volume control, operated by the smaller of the two knurled aluminium knobs, and an adjacent rotary switch selects the signal source from various combinations of four rear-panel inputs. Lovely though these aluminium knobs are, I’d have thought it more logical to use the larger knob for the volume control rather than the source selector. Nevertheless, the volume controls are nicely weighted and the switch is very positive, with the apparent benefit of a self-cleaning action, which augurs well for a long and reliable working life. The rear panel carries an IEC mains power inlet with integral fuse holder and voltage selector (230/110 V AC), and the unit’s metal chassis is bonded directly to the mains safety earth, as it should be. Unusually, though, the audio circuitry’s ground reference has no connection whatsoever with the mains safety earth, and relies on picking up a ground reference from the connected source equipment, in an effort to avoid creating ground-loops. However, a chunky 4mm binding post on the rear-panel is also provided so that the internal audio ground can be connected to a studio’s ‘technical earth’, if required. The four rear-panel quarter-inch TRS inputs are labelled A, B, C, and D. These accept balanced or unbalanced line-level signals and the input sensitivity is switchable in pairs (A and B, C and D) between nominal +4dBu and -10dBV levels. The front-panel source selector switches for each stereo headphone channel determine the routing of these inputs in six different combinations, as two stereo, four mono, or one stereo and two mono cue feeds. So, for a stereo feed, the selector is set to ‘AB’ (or ‘CD’), and the A input then appears on the left side of the headphone and B on the right (or C on the left and D on the right). Alternatively, each individual input can be routed to both sides of a headphone output as a dual-mono feed, using the switch positions labelled AA, BB, CC, or DD. The front-panel headphone outputs are duplicated on the rear — a useful feature when rackmounting. Aside from the illuminated power switch, the only feature I’ve yet to mention is the (new) LED level metering. Each of the four inputs has an associated tri-colour LED which starts to glow green when the input level exceeds -24dBu, gradually getting brighter up to -8dBu. At 0dBu it changes to orange and the brightness increases to +10dBu. And then at +16dBu the LED turns red and again grows brighter still until +18dBu. Needless to say, the optimum technical performance is achieved when the signal stays mostly in the green and orange regions. Internally, the HeadLite 3 is constructed with a single main circuit board covering most of the available chassis floor, and a large toroidal power transformer on the right-hand side. The audio inputs are handled by the ubiquitous THAT Ingenius 1200 differential receivers, and over-voltage protection circuitry was added for this model to protect against accidental mis-plugging into lines carrying 48V phantom power. The headphone amplifiers themselves employ JRC 4580 dual op-amps, which are high-current devices specifically intended for headphone amplifier roles, and they are configured here to provide a fixed 20dB of gain, with the volume controls adjusting the input signal level. The initial HeadLite 3 models employed all-analogue metering circuitry constructed on a small daughter-PCB using traditional through-hole components. However, the latest builds incorporate a new ‘computer-controlled’ metering design on a daughter-PCB built with surface-mount (SMD) components. One other significant change from previous generations of HeadLite is the omission of the ‘Power Stage’ on headphone channel 1. This feature was intended to meet the current demands of multiple (parallel-wired) headphones being driven from one output — a technique sometimes employed in big recording sessions. However, it seems that very few of DACS’ clients ever made use of this facility, or invested in the option to upgrade the other headphone outputs, so all four headphone amplifiers in the HeadLite 3 are the standard version — although this is still capable of providing 0.5W RMS per channel, which is more than beefy enough for most situations. For those (few) clients who genuinely require a more potent headphone output capability, DACS still offer a Power Stage upgrade, with a newly designed discrete‑transistor plug-in amplifier module to boost the output current and power capability. This module can be installed on any number of outputs either at the time of purchase or as a retrofit. The HeadLite 3 is simple to operate and works very well. While there are undoubtedly both less expensive and more elaborate headphone amplifiers, the elegant simplicity, purposefulness, and quality of the HeadLite 3 remains very attractive. The new metering provision also provides welcome confidence that the right signals are reaching the right inputs at sensible levels, and the ability to operate the unit in various combinations of mono and stereo modes is also very useful. If this unit were to stay in my own rack, I’d probably swap the large and small knobs around — it feels more natural to me to reach for the larger control to adjust the volume. I experimented with my entire headphone collection (a variety of well-known open- and closed-back ‘studio standard’ models from AKG, Sennheiser, Beyerdynamic and Sony), and found there was plenty of power to make them all uncomfortably loud, while maintaining negligible background noise and distortion. What more could be asked of a headphone amplifier? Four-channel headphone amps range from lower-cost options like the ART HeadAmp 4, Samson S‑Phone, Rolls HA204, PreSonus HP4, Mackie HM‑400 and Aphex HeadPod 4, up to very high‑end products from the likes of Klang and Lake People. Well designed and well built — a quality product all round. None... unless it’s beyond your budget. This simple but effective high-quality, four-channel headphone amplifier boasts powerful headphone amps and versatile input switching options.